Special effects artists Alec Gillis and Tom Woodruff, Jr. joined us today to talk about their upcoming movie Harbinger Down. We got the story behind the creatures they created for Tremors, Starship Troopers, and Alien 3 — and they told us about the real-world inspirations for their movie monsters. It is our belief that the best material comes from Nature. We always say the strangest things are in the grass in your front yard. Science fiction movies require a little bit accuracy to the natural world to create a creature that is believable. Horror films can draw more on the psychological as inspiration for the design. 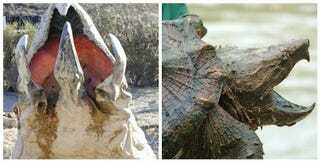 The head of the Graboids from Tremors are partly based on a snapping turtle! Ria, if my desk was big enough, I'd have several volumes of animal life open on it all during a design phase. From our earliest beginnings and influencing the design of the Graboid by studying elements of a snapping turtle, I've always believed that the audience needs something to anchor a creature to real life. I believe true, unfettered art can exist in a different template but as part of the story-telling of movie, I want the audience to believe our work. So if they see the silhouette shape of a snapping turtle or the heavy skin breakup of an elephant or rhino it helps turn the gears in the head to believing the whole package. I'm glad to know that people see real life elements in our work - so much the better. So much more to believe. You can read more about the stories behind the creatures that live onscreen — including just where else the claws from Starship Troopers' Warrior Bugs have appeared and the exact makeup of the Predalien creature from Alien vs. Predator ("80% Alien and 20% Predator" — right here. Ask These Special Effects Artists How They Create Movie Monsters!